1. Mix the mustard and the honey and spread the dressing evenly on one side of the tortilla. Place the chicken in a line going down the tortilla’s center. 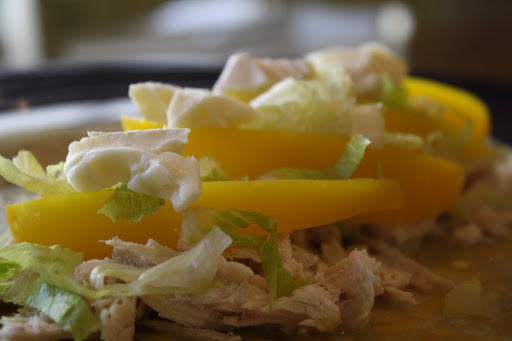 Sprinkle the lettuce over the chicken and top with the bell pepper slices. 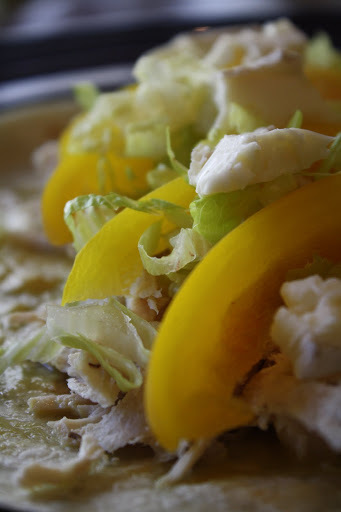 Crumble a 1/4-inch slice of brie over the bell pepper. Wrap the tortilla and serve. As lunchtime approached, I wandered aimlessly around my kitchen, opening and closing the refrigerator door, rummaging the pantry, wondering what exactly I wanted to eat. After surveying the available ingredients, I decided on something light, healthy, but still satisfying. This fresh, flavorful chicken wrap achieved all my desires, solving my uninspired cooking slump. 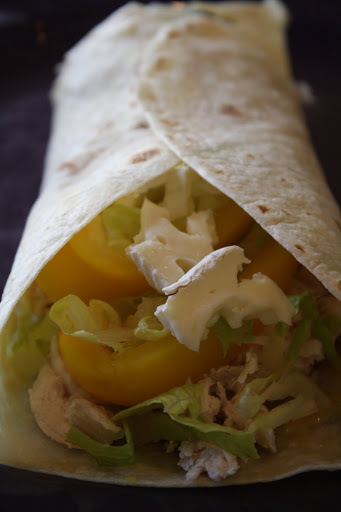 With its sweet honey mustard spread, crunchy vegetables, and creamy brie, this simple and nutritious chicken wrap hits all the right notes. The wrap provides the same boost as a sandwich without the heaviness of white bread. Best of all? The recipe utilizes convenient kitchen staples, making it a go-to option when you find yourself in a frustrating cooking rut. 1. Combine the flour, 1/2 cup sugar, and salt in a medium bowl; whisk to blend. Add the butter. Rub the butter in with your fingertips until the mixture sticks together in clumps. Mix in the oats, nuts, and vanilla extract. 2. Preheat the oven to 375 degrees. Place the 1/3 cup sugar in a large bowl. Add the blueberries to the bowl and toss until they are evenly coated in the sugar. 3. Pour the berry filling into an 11x7x2-inch baking dish. Sprinkle the oat topping evenly over the fruit. 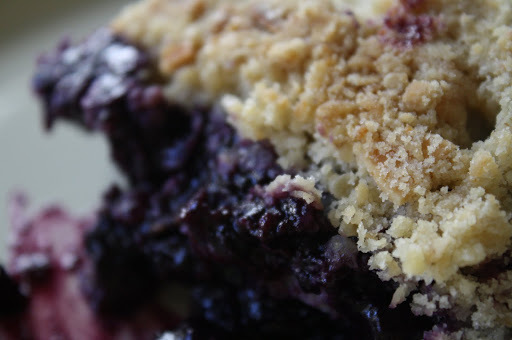 Bake the crumble until the filling bubbles thickly and the topping is crisp, about 45 minutes. After removing from the oven, allow the crumble to cool for 15 minutes. Serve warm with a scoop of vanilla ice cream. 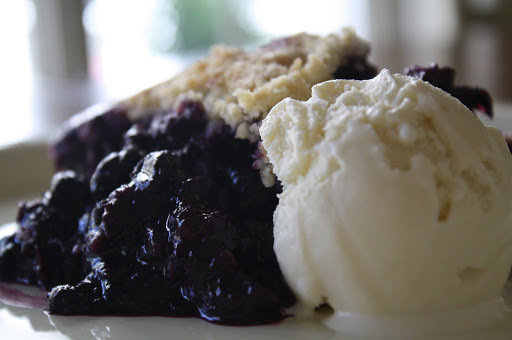 Incredibly easy and delicious, fruit crumbles are my ultimate go-to desserts. 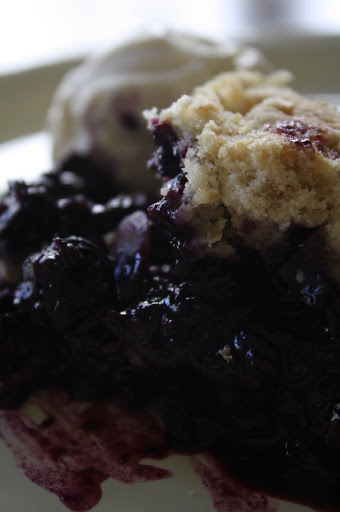 With its combination of crisp, butter-specked topping, soft, naturally-sweet blueberries, and soothing vanilla ice cream, this delectable blueberry variety serves as the perfect end to a summer barbecue. You can substitute blueberries for various seasonal fruits such as apricots, peaches, or nectarines. This classic dessert will surely impress all your dinner guests, encouraging them to return for seconds (or sometimes thirds, in my case!). 1. Preheat the oven to 350 degrees. In a large bowl, mix together the oats, nuts, coconut, brown sugar, cinnamon, all spice, and salt. Whisk together the oil, honey, and water in a small bowl or in a measuring cup. 2. Pour the liquid mixture over the oat mixture and stir with a wooden spoon until all the oats and nuts are evenly coated. Spread the granola onto a large sheet pan and bake, stirring occasionally, until it turns an even golden brown, about 30-40 minutes. 3. Remove the granola from the oven and allow to cool completely, stirring occasionally. Add the dried cranberries. Store the cooled granola in an airtight container. I am a self-declared granola connoisseur. My pantry hosts numerous boxes of various granolas, all crammed side-by-side in a line, as though nervously awaiting my judgement. 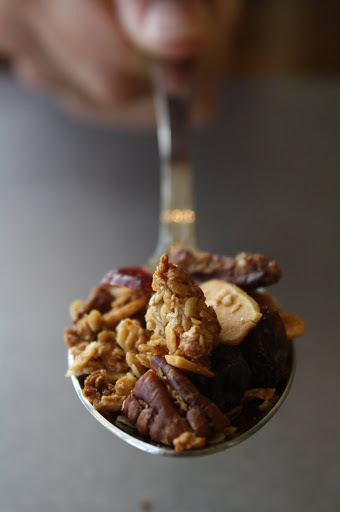 Having sampled countless variations of this hearty breakfast item, I can confidently say that this homemade granola takes the cake in every category: taste, consistency, and healthiness. Packed with hidden preservatives and sugars, store-bought granola does not live up to its healthy reputation and leaves you unsatisfied after the meal. My homemade version maintains a tasty, nutritious combination of flavors and provides you with a strong boost of energy to start the day. Each spoonful contains crunchy, golden brown oats and nuts, chewy dried cranberries and tender wisps of coconut, all coated in a subtle layer of honey and brown sugar. Served with sliced bananas and milk, granola simply cannot get any better. 1. 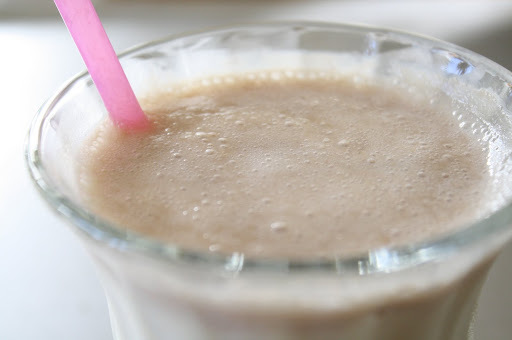 Place all the ingredients in a blender and pulse until completely liquefied. As summer nears an end, I try to relish every last, precious day. While baking under the sun, dipping my toes in the pool, nothing is more refreshing and more oh-so-summertime than an homemade fruit smoothie. 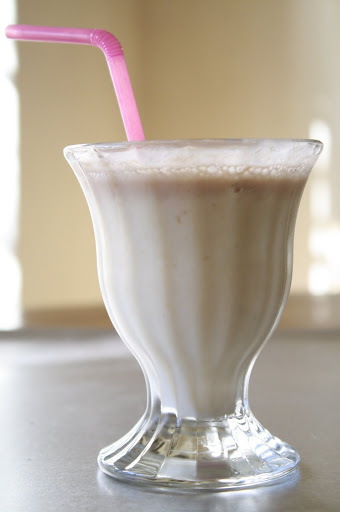 This light, frothy honey-banana smoothie captures all that is summer in each delightful sip. 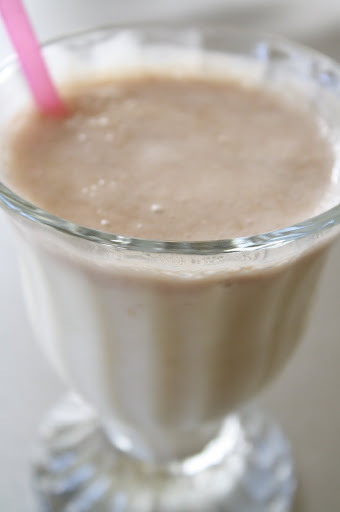 The creamy, tangy greek yogurt slightly thickens the smoothie, also contrasting well with the honey’s sweetness. In the coming weeks, I will definitely create more delicious variations of this quintessential beverage, savoring every final, summery drop. 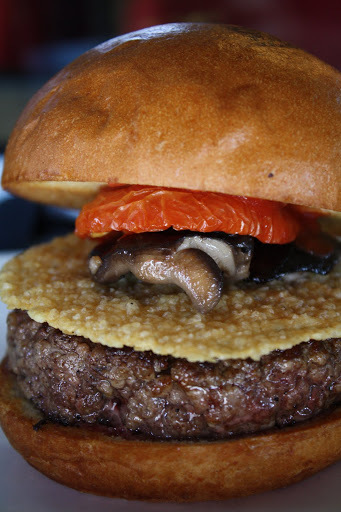 Juicy, angus beef patty, thin, paper-like parmesan crisp, sauteed wild mushrooms, and a watery, char-grilled tomato slice all pressed together within an airy, lightly-toasted brioche bun. That is what the first bite of an Umami burger tastes like. Their signature sandwich harmoniously combines these individually-distinct flavors into a single, heavenly dish. Each burger on Umami’s menu is carefully-assembled, incorporating various unusual tastes to create a brilliant final product. Featured in today’s Los Angeles Times food section, Umami has five locations within Los Angeles, each restaurant with its own original decor and ambience. During our visit, my family and I sampled the Umami, SoCal, and Earth burgers. All three exceeded my expectations. With its trademark beef, crunchy butter lettuce, savory house spread, and sweet, caramelized onions, the SoCal burger ranked highest on my list of menu recommendations. The pleasant, attentive service heightened the experience as each server patiently explained the menu items and enthusiastically answered any questions I had. I highly recommend Umami for its ideal mix of fresh, quality ingredients with new, innovative pairings that will surely leave you craving for more.